Disney’s Frozen, their take on the Hans Christian Andersen tale “The Snow Queen,” will probably be disappointing. Don’t get me wrong, there’s plenty to love about it. It’s a movie with a female lead, and at least one other major female character. There’s an all star cast that includes Kristen Bell, Alan Tudyk, and Idina Menzell. It’s set in an unnamed Nordic country, which is something we’ve never seen before, and, in an interview with MTV Geek, Bell, who voices the protagonist, says she “made this girl much more relatable and weirder and scrappier” than previous female Disney leads. All of this is great. But here’s some context: the original story follows Gerda, a girl who goes on a cold journey to rescue her (male) friend Kai from the titular Ice Queen. It’s a pretty great reversal of the damsel in distress narrative but, so far, it looks like the movie, out this November, will have nothing to do with the original tale. Not only is Gerda (now named Anna) saving her sister, who is the Ice Queen, she’s also not making the trip solo. This time, she’ll be accompanied by Kristoff, a mountain man. Kristoff, incidentally, is one of two male characters who are almost sure to act as romantic interests. The presence of deeply entrenched gender norms, however, isn’t this film’s only potential failing. Once again, the “princess” (and they always seem to end up being princesses regardless of actual royal affiliation) will be white. Keep in mind that Frozen will be set in an area of the world that is home to many indigenous cultures, among them the Inuit and the Sami. In fact, Mike Gaimo, the film’s art director, directly says that one of his many inspirations for the film was the Sami people. Aside from the fact that it’s extraordinarily disrespectful to lump an entire culture into a listicle that features such points of interest as “castles” and “snow,” it seems strange that the Sami would inspire a world that, so far, seems entirely populated by white characters. Their whiteness is so blinding it’s making her cross-eyed. 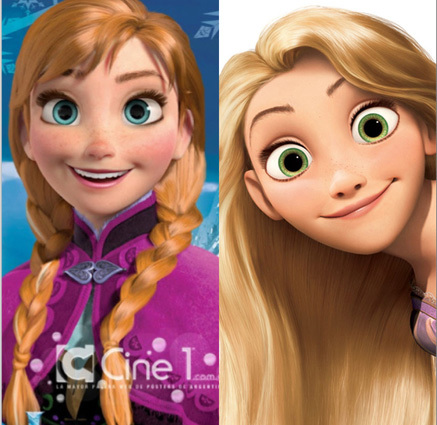 This is a huge missed opportunity for Disney who, besides the fact that they’ve basically made a carbon-copy of Rapunzel, seem fiercely committed to having as few princesses of colour as possible. This hasn’t gone unnoticed by fans, and among quite a lot of backlash, a tumblr named Snow Queens and PoC has taken on the task of reimagining what the movie might have looked like had a woman of colour been chosen. The tumblr—often featuring a protagonist who is either Inuit or Sami, but also sometimes Mongolian or Kazakh, among others—features some great art, but has also managed to start a conversation around the film, and about Disney’s overall track record. I can’t help thinking that any of the proposed character designs would make for a more creative and compelling film, and with so many amazing alternatives available, it’s hard to warm up to the story that Disney is actually proposing. Top image by Rah at weepingrockrock.tumblr.com, via Snow Queens and PoC. P.S. Get used to the pun in the title, puns are here to stay.